As is my want, I have been seduced by yet another interesting period in military history, that of the French & Indian Wars of the mid 18th century. This era of European colonialism spread to the four corners of the globe and in North America and Southern Canada confrontation between the French and British created sparks that lit the fire which would spread to Europe in the form of the Seven Years War. What makes this such an interesting subject for me is that few major battles of the ‘European style’ really took place as the terrain made this somewhat impractical and so most encounters were of a skirmish nature with troops fighting in open order instead of the closed formations usually employed during this period. 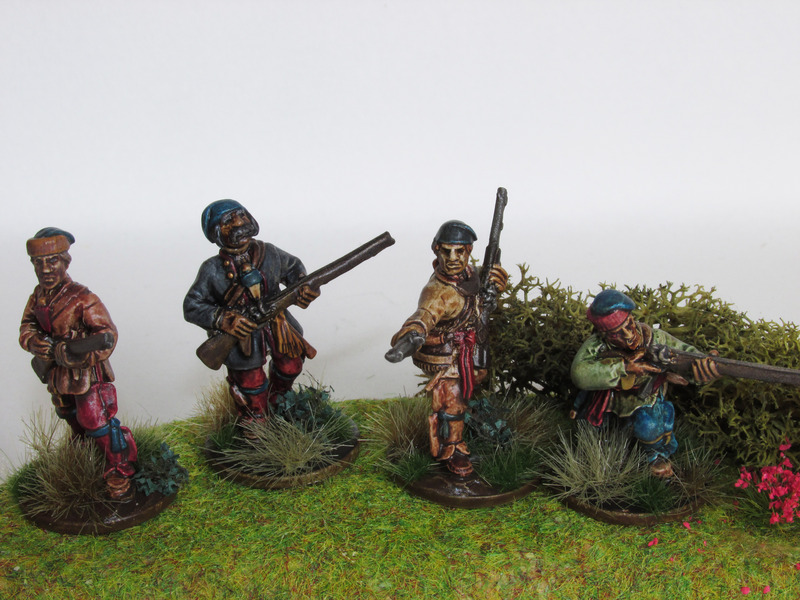 This is the perfect opportunity to do a black powder skirmish game! Many were undercoated in black over a previous paint job which lost quite a bit of the detail of the miniatures so I proceeded to strip them down to the metal ready to be based and undercoated for painting. Now I have to admit that painting has always been my least favourite aspect of the hobby, recently however, I am finding it much more cathartic and I have been happily painting a miniature a day.